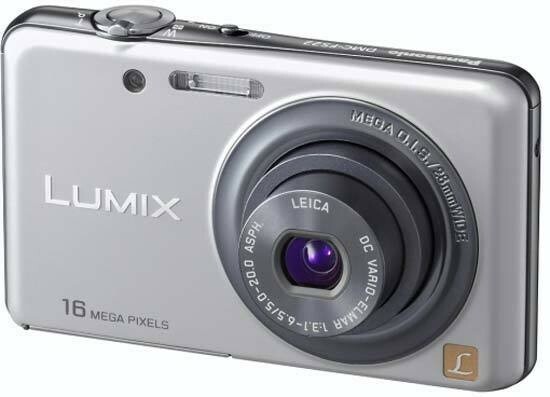 The Panasonic Lumix DMC-FS22 (also known as the DMC-FH7) is a slim and stylish digital camera with a 4x, 28-112mm optical zoom lens. The FS22 also features a 3 inch touch-sensitive screen with Touch AF, Touch Zoom and Touch Shutter functionality, and it can record HD movies in 1280 x 720p at 30fps. The 16.1 megapixel DMC-FS22 offers Panasonic's now standard Intelligent Auto mode for quick and easy shooting, Sonic Speed AF system, High Sensitivity mode and Extra Optical Zoom. The FS22 / FH7 is available in silver, black or pink for £169 / $179. Slipping neatly into the stylish range of Panasonic's line-up, the Lumix DMC-FS22 looks like a simple point and shooter. It's not until you look a bit closer and see the extra features that Panasonic have used to boost the quality of the camera. The small lens on the front is a Leica DC Vario-Elmar with a 4x optical zoom that is steadied using Mega OIS (Optical Image Stabilisation). Minimalism appears to be the trend on the Panasonic Lumix DMC-FS22 because there's only one button which is the shutter release. Wrapped around that is the zoom rocker while the power switch is located just to the left. Everything else is on the 3 inch touch-screen which takes over the entire back of the camera. What amuses us is that with the touch and shoot option that Panasonic add to their touch-screen models, the shutter release button is pretty much redundant. That leaves only the zoom and that could also be integrated into the touch-screen meaning that all buttons and switches aside from the power switch could be removed from a camera. That would be a radical design. The camera body is built to a high standard with a metal casing. The lens has only a very small amount of play in it which is great and the screen sits flush with the body so won't get caught and chipped at the edges. The battery door can sometimes be an issue with digital compact cameras because they can sometimes be a bit flimsy. The Panasonic Lumix DMC-FS22 does suffer from this but it's not overly bendy. There's also a lock to keep the door closed and prevent accidental opening while shooting. Alongside the lithium ion battery is where the memory card is located. The Panasonic Lumix DMC-FS22 takes an SD type card and is compatible with all variations including the newly released SDXC version. What we do like is the snap open/shut USB cover because some cameras have very feeble covers and some don't have any at all. We think that a similar cover for the battery would be great. Because of the lack of buttons, there's plenty to do on the screen. The red camera icon accesses the shooting modes such as the two auto modes, both intelligent and normal, beauty skin mode, my scene mode, normal scene mode and video. Below this is the playback button for looking at the pictures you've already taken. The two most interesting buttons are located below these. The button on the left activates touch and shoot where you can simply touch the area of the screen you want to be sharp and the camera will focus automatically before taking a picture. Remember what we said about the camera being radical if there was an on-screen zoom function? That's what the button in the bottom right corner does. There's a slow or speedy zoom option depending on how fast you need to bring something closer to you. Of course this begs the question of why the manual zoom rocker is still present as the on-screen function renders it obsolete. We think it's simply down to what a consumer expects to see on a camera. Tapping on the menu button brings up 2 more options for accessing the shooting menu or set-up menu. The record menu scrolls the options along the bottom of the frame while the button with an M and a spanner will allow you to create 2 shortcuts of your favourite modes on the main screen. Simply press the M button, choose the options you want and drag them into the windows on the left of the screen. Delving into the playback menu, the same menu and display buttons are present on the screen but pressing the menu button changes the shooting menu to the playback menu with the ever present set-up menu beside it. There are lots of options to do in the playback menu such as resizing, cropping, setting for upload and print or select as a favourite. You can also lock images so that they're not tampered with in any way or you can copy them to another memory card. In the box there's quite a lot comes with the Panasonic Lumix DMC-FS22. A basic user's guide accompanies the full guide which is found on the enclosed CD. This CD also stores drivers for the computer, if needed, PHOTOfun STUDIO 6.0 software and Super LoiLoScope which is a video editing system. The charger is a separate unit for placing the battery into and has a cable which is also included. There are 2 cables for connecting the Panasonic Lumix DMC-FS22 to a computer: the standard USB cable and a video cable that also plugs into USB. Unfortunately, this then converts into an analogue format because of the yellow cable on the other end. Annoyingly, there's also only a white audio lead meaning that there's no stereo sound using this cable. The best option is to avoid using this cable altogether. Either transfer videos directly onto your computer and view them there or use a card reader. Either way, it's best to get rid of the need for this cable to retain digital quality. Along with the wrist strap, there's also a touch-screen nib for precision operation of the screen and its functions. As we used the Panasonic Lumix DMC-FS22 through the test, we found that we were pleasantly surprised by its performance. There are a few features we'd like to see upgraded sooner rather than later such as the slow focusing system on the touch and shoot mode or the painfully slow start up time. There's nothing wrong with using a bit more rigid plastic in the battery lid to continue the trend of good build quality throughout the whole camera. Everything else works a treat which is pretty much what we've come to expect from a Panasonic digital compact camera of this calibre. So it's a positive response in terms of what the camera is stuffed with. But does the Panasonic Lumix DMC-FS22 perform as nicely as it looks?